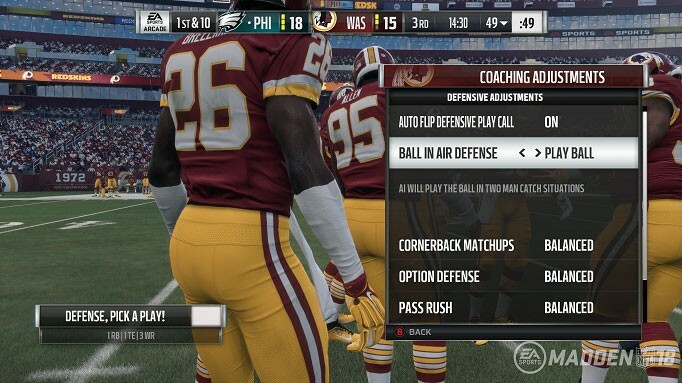 If you have ever played any of the NCAA Football series, you most likely remember the coaching adjustments menu. That feature is now being moved over to Madden. Not everything about it is the exact same, but the basic concept of it is very similar. You will be able to make certain adjustments on the fly that decide how your team will play a particular event. It is fairly straight forward in nature, but does open up the discussion for a few things. The first and most important discussion to have regarding coaching adjustments is whether or not you will be able to use them all situationally or just be pigeon holed into using the same setup all game long like many players were on the NCAA series. For example, on NCAA you were unable to use anything but conservative running style because if your opponent had their strips set to aggressive you would fumble constantly (multiple times per drive) using any other setting. There was also a thing where if you had your defensive pass rush set to aggressive the opponent could just sit there fake hiking until you were drawn offsides. There were also settings that were a total benefit on NCAA as well such as setting your zones to aggressive, even with this setting you would not give up anything extra over the top and it would make your defenders jump anything short like they were psychic. Another thing that the coaching adjustments raises this year is whether or not the read option will return to being relevant. This year keeping the ball with the Quarterback when they played the Runningback was mostly pointless. Rarely would the Quarterback actually make it anywhere before another defender reacted or blockshed making the play a total bust. Now you will be able to choose the way you play the option in a much more straightforward and simple fashion. There doesn’t seem to be a logical need for this feature unless read option is once again a useful concept. Then the final thing coaching adjustments makes us question is the Cornerback Matchups. Madden had a feature called “man assignments” back in Madden 12, and the feature was filled with problems and glitches that would destroy the offenses ability to read coverage, and on the offensive side could create monumental man switch glitches in the defense’s coverage. Provided nothing like that happens, this feature is one that has been needed for a very long time. That being said, history has a really funny way of repeating itself. Lets just hope it doesn’t do that with coaching adjustments. If you enjoyed this article please take a moment to share it on social media. It helps us out a ton when you share our content, and we really appreciate it. You can also comment below and tell us your thoughts and feelings about coaching adjustments because we love discussion and interacting with the community.